Here is my very own personal garage makeover! Just about five years ago we moved into this house which has a narrow “two car” garage and a large loft for storage with unfinished walls. After finishing many indoor home projects, we finally got around to finishing and organizing the garage. The dream garage makeover was to do insulation and drywall. Then apply a bright clean coat of paint and some shelving, allowing us to have space to get around and have things be organized, neat and easy to get to. 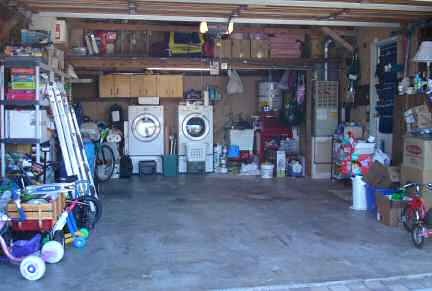 In the “before” stage, our garage wasn’t terrible. Or rather, it could have been much worse. 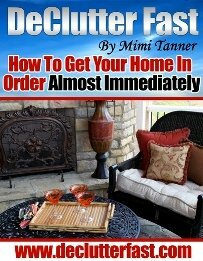 We had bought several shelves to store and organize a lot of our belongings. 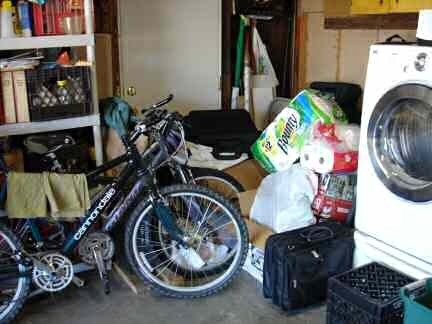 But we also had a lot of stuff in the loft and a lot stacked on the sides of the garage giving us less floor space and a bit of a mess. Left side toward the front - where the kids' outdoor toys are. Left side toward the back – we have the shelves, but they’re full and there is stuff in front of them blocking them. Back left corner – we can’t even get to that door if we wanted to use it with all those boxes, bikes and stuff. Back right corner – we can’t get to our utility sink or the tool cabinet. Even getting to the washer and dryer can be tricky sometimes. 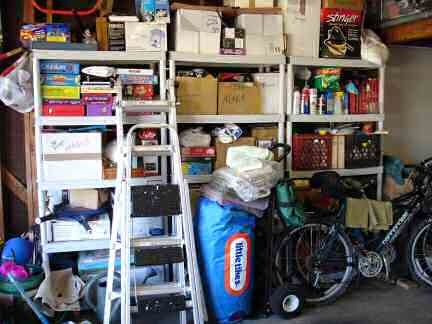 Right side – there is a nice little food storage shelf to the back there, but the rest of this side is boxes and miscellaneous junk. 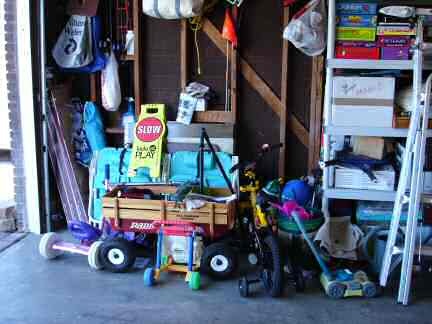 A big part of our garage makeover was to declutter and toss a lot of things we no longer used or needed. There are still a few more things that we’re in the process of getting rid of, but we’ve made a large improvement. We don’t have a basement and have minimal closet space in the house, and this is pretty much everything “extra” and it all fits in the garage without being overwhelming. My husband started insulating the walls many months ago, over a year ago, maybe two, as I see the kids tricycles and some of our other possessions have significantly changed. His time was limited so he did what he could on weekends here-and-there. Once we got it insulated though, we were stuck. With all the crazy angles of the ceiling and the height, and the time it would take for someone of our skill level to do the drywall and tape, we came to the conclusion that we were best off to hire someone and use the time saved to spend with our kids before they forgot who we were. The drywall people we hired took a day and a half and were done! (Good decision.) Then it took us the next three weekends in between family stuff to paint, put up the shelves and store everything away in an organized manner. 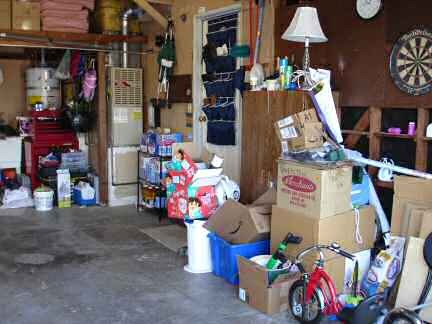 I understand that my garage will never be featured in Better Homes and Gardens or in an advertisement like the ones you get in your mailbox showing a perfectly organized garage with hardly any belongings in it. 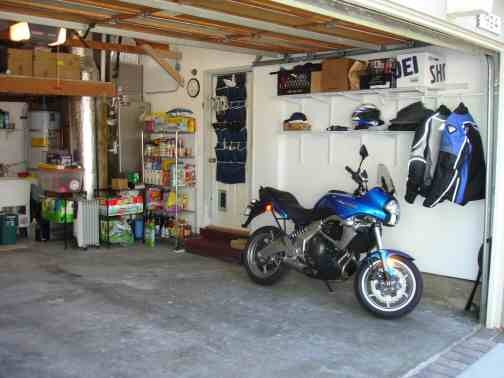 My garage is pretty average and I would think it represents most people’s garages, not those in magazines. I would like to say that in a perfect world, all the bins on the shelves would be matching, but that costs money. For now, we will live with the cardboard boxes, crates and bins that we have on the shelves. I will upgrade them over time. However, I have made a point to label the boxes which is very important. One last thing… until I can redo the photos, there are a few things still in the garage that we’re trying to get rid of. So hopefully, we’ll clear up a little more space when we get rid of those items. 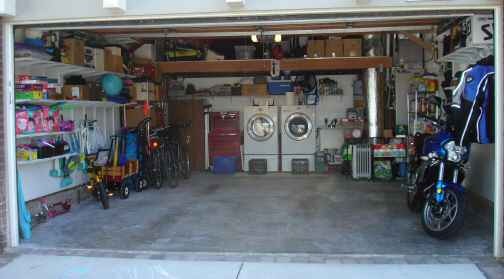 So, here are the after pictures of our garage makeover! After – full view, notice the floor space and though there is still a lot of stuff in there, it isn’t as messy and overwhelming. The storage cabinet and tool chest now sit at the back and are easily accessible. We are able to use that back corner door to the side of the house and we can get to the utility sink! After – left side, we put the shelves up leaving the floor space for the bikes, tricycles (not in picture, but go in the clear space under the shelves toward the front), the wagon and the blue jumpy house. All the kids’ outdoor toys are on the lowest shelves so they can reach them. The Easy Ups boxes will be replaced at some point with nicer storage bins. (Hey, those Dora boxes were excellent free storage!) Toward the back of the garage we put up a metal 5 shelf unit to hold heavier boxes and items. After – right side, is a major change. Since my husband decided to take up riding a motorcycle (which sort of inspired the finalization of this garage project), we needed a clear space to put it. The cabinet along with all the boxes of stuff had to go somewhere else. This left us with a nice clean wall for the motorcycle and some shelves above it for a few things. I also got a larger, taller storage shelf on wheels to use even more vertical space in front of the furnace and organize our stockpile of food. 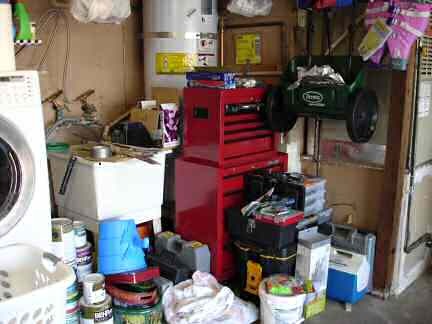 I hope you find these before and after garage makeover photos fun and inspiring. Organizing a garage was fun, in my opinion. I know it’s not perfect, but it’s real, and it’s a huge improvement and highly functional which is very rewarding. 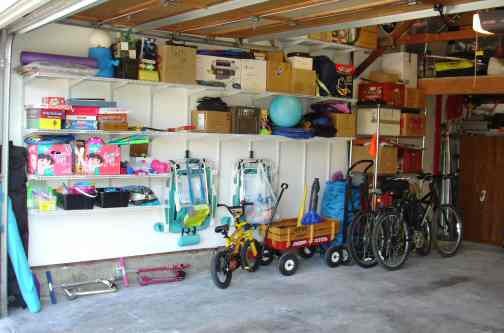 In case you’re interested, for our garage makeover we used ClosetMaid shelving systems for the walls. The Home Depot is literally within walking distance from our house so we were able to visit often to check things out and make changes to our design.